Indigenous Peoples is a collective term to encompass the diversity of cultures within First Nations, Inuit and Métis experiences. First Nations refers to persons who identify as such and who may or may not be federally registered under that title in the Indian Act. According to the Assembly of First Nations, the First Nations population represents over 50 distinct nations and language groups and is made up of 634 First Nations communities (or "reserves"). Inuit people are descended from the ancient Thule people, and have occupied parts of Canada’s northernmost regions thousands of years before European arrival. Métis people are descendants of mixed Indigenous and European ancestry have their own culture, language (Michif), traditional homeland (the Métis Nation Homeland includes Manitoba, Saskatchewan and Alberta, parts of Ontario, British Columbia, the Northwest Territories and the Northern United States) and a sense of nationhood. However, with the Indian Act, on and off reserve housing, programs aimed at curbing urban Indigenous homelessness, and the “system” in general has, it would seem, failed Indigenous Peoples nation-wide and made them housing insecure from Vancouver to Halifax. Urban Indigenous Peoples experience homelessness at a disproportionate rate and make up a significant percentage of people experiencing homelessness in cities. Research shows that Indigenous homelessness in major urban areas ranges from 20-50% of the total homeless population, while others have reported that the range may be much wider, at 11-96%. Put another way, in some Canadian cities such as Yellowknife or Whitehorse Indigenous Peoples make up 90 percent of the homeless population. Places like Thunder Bay and Winnipeg fair somewhat better; an average of 50 percent of those experiencing homelessness are Indigenous. In Toronto, Canada’s largest urban centre, Indigenous Peoples constitute around 15 percent of those experiencing homelessness in the city, even though they make up only around 0.5 of the total population. In fact, one study found that 1 in 15 Indigenous Peoples in urban centres experience homelessness compared to 1 in 128 for the general population. 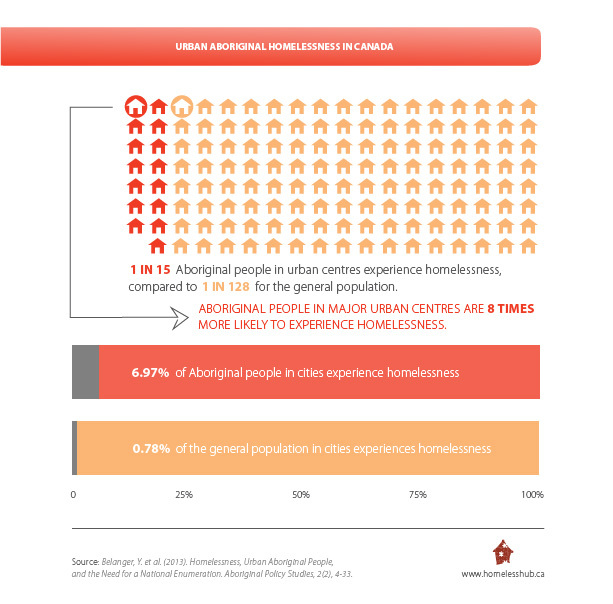 This means that Urban Indigenous Peoples are 8 times more likely to experience homelessness. Homelessness amongst Indigenous Peoples can be traced back to historical trauma, oppression, racism and discrimination. Homelessness amongst Indigenous Peoples should be considered as a consequence resulting from Canada’s history of colonization and exploitation of Indigenous land and populations. Significant abuse and cultural trauma occurred through the use of residential schools to house and educate Indigenous children. Furthermore, the 60’s Scoop – which took Indigenous children and placed them in white foster homes within the child welfare system has led to unstable families and homes. Many of the personal issues (including familial dysfunction, substance use, addictions, health issues, community violence) faced by Indigenous Peoples and that act as contributors to homelessness can be directly linked to various types of historical trauma. Structural issues can include transitions from reserves to urban living, racism, landlord discrimination, low levels of education and unemployment. As a result, research has shown that Indigenous populations disproportionately experience lower levels of education, poorer health, higher rates of unemployment and lower income levels compared to non-Indigenous people. There are also serious social issues stemming from the historical trauma including high incarceration rates and high suicides rates amongst youth. Housing conditions on reserves and in Metis and Inuit communities are often sub-standard leading some researchers and Indigenous activists to state that on-reserve housing should also be considered part of homelessness. Indeed, as Indigenous homelessness does not fit neatly into the four typologies of the Canadian definition of homelessness (Unsheltered, Emergency Sheltered, Provisionally Sheltered, and At Risk of Homelessness), COH has worked to define Indigenous homelessness from an Indigenous perspective. Through listening and consulting with Indigenous Peoples who shared with us what they themselves understood Indigenous homelessness to be. From this, it is clear that being without a home via an Indigenous worldview is not simply a lack of accommodation or structural habitation, but rather is a web of relationships that involves connections to human kinship networks; relations to animals, plants, spirits, and elements; relationship to the Earth, lands, waters, and territories; and connection to traditional stories, songs, teachings, names, and ancestors. All these aspects of the circle of interconnectedness are known as “home” in Indigenous societies and worldviews.